As the cold of winter wanes and the calendar flips from March to April, Name of the Year too marches onward. This entry marks the beginning of the end; regionals are no more as the 2017 Sweet Sixteen are revealed. 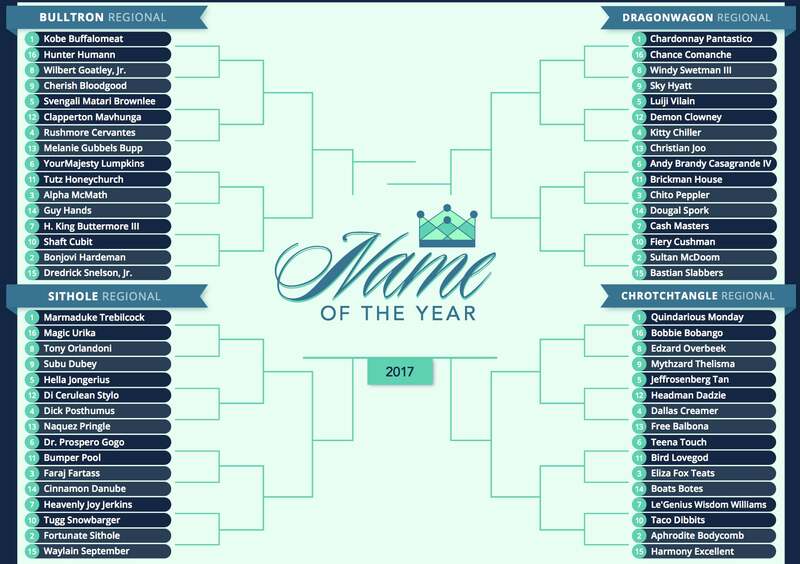 With the picture becoming clear, Name of the Year voters are eager to learn who will make it all the way. All four one-seeds (college softballer Chardonnay Pantastico from the Dragonwagon regional, football player Quindarious Monday from the Chrotchtangle regional, college football lineman Kobe Buffalomeat from the Bulltron Regional, and 19th century Cornish resident Marmaduke Trebilcock from the Sithole regional) remain intact. 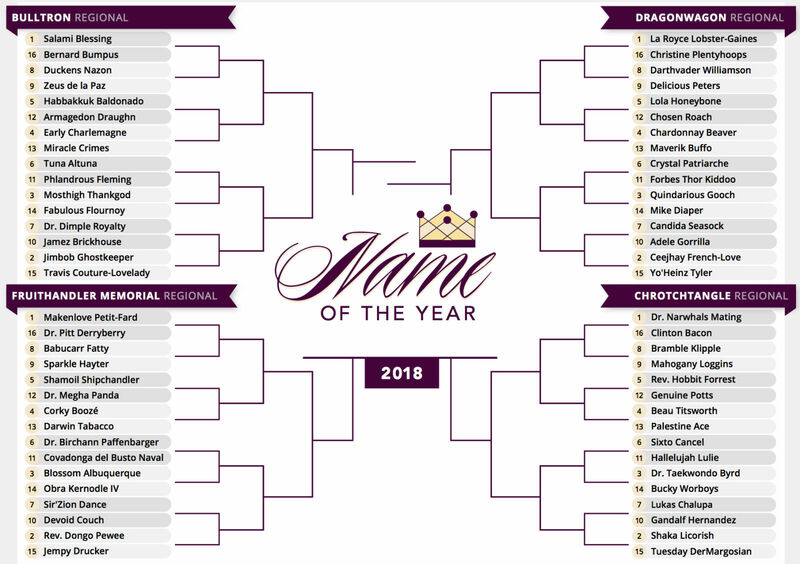 A few lesser seeds also advanced in upsets, including attorney and seven-seed H. King Buttermore (winning by a mere 11 votes) and 14-seed Boats Botes (advancing by a massive margin). Each remaining name, Cinderella story or not, offers a unique story, an individual rhyme, a something special for each voter to consider. 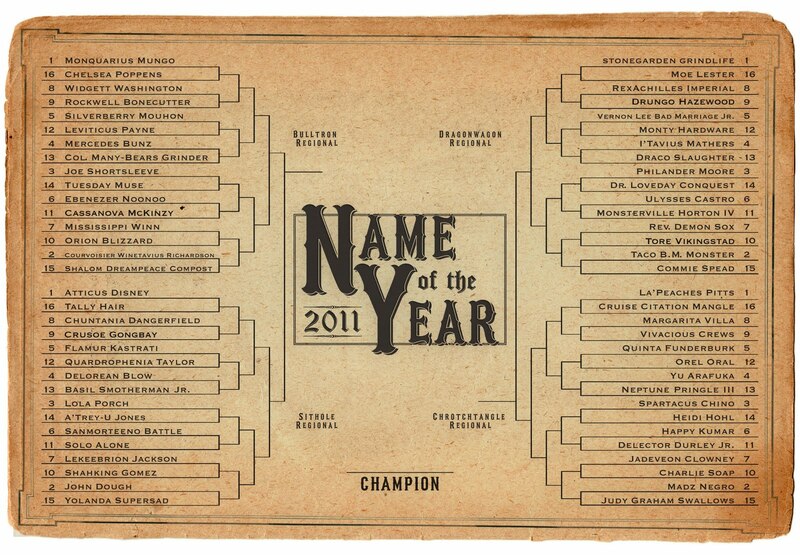 With the bracketology simplifying, we can step back and ponder this question: What’s in a name? Is it the story the name tells? The tempo of the sounds rolling off the tongue? Perhaps something deeper and more profound? Shakespeare may have made this question famous by writing it into Romeo’s mouth, but a more-recent author may be better suited to answer the question for, when it comes to memorable names, there is none greater than Dr. Seuss. 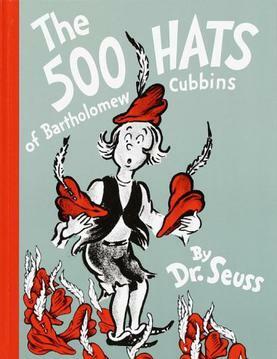 Silly names adorn his pages, ranging from Bartholomew Cubbins (proud owner of 500 hats) to David Donald Doo (known for sleeping through his ABC’s) to JoJo McDodd (the future mayor of Whoville). Here at Name of the Year, where names provide inspiration, we search the real world for names that could live on his pages. Those names are both old and new and come from all over: international athletic competitions, obscure news stories, and collegiate academia. Enter Melanie Gubbels Bupp the 13-seed out of the Bulltron Regional. One may nitpick that her first name is nothing extraordinary, but her two surnames make up for that several times over. Assonance? Check. Consonance? Present. A harmonic confluence creating an immeasurable joie de vivre? Totally there. The name springs forward as though Dr. Seuss has written her buying a thneed or counting fish. Brilliant and altruistic, Gubbels Bupp may be the complete package. However, the completeness of one’s package does little good when clashing the giants of the 2017 Name of the Year bracket. After all, she barely snuck past four-seed Rushmore Cervantes in the Bulltron Regional, and again narrowly staved off five-seed Clapperton Mavhunga in the subsequent round. She’ll need to remain hot against her heavily-favored opponent Kobe Buffalomeat if she hopes to advance to the Elite Eight and ultimately take home Name of the Year gold. The time for storytelling is over. The time for linguistic wonderment has begun. 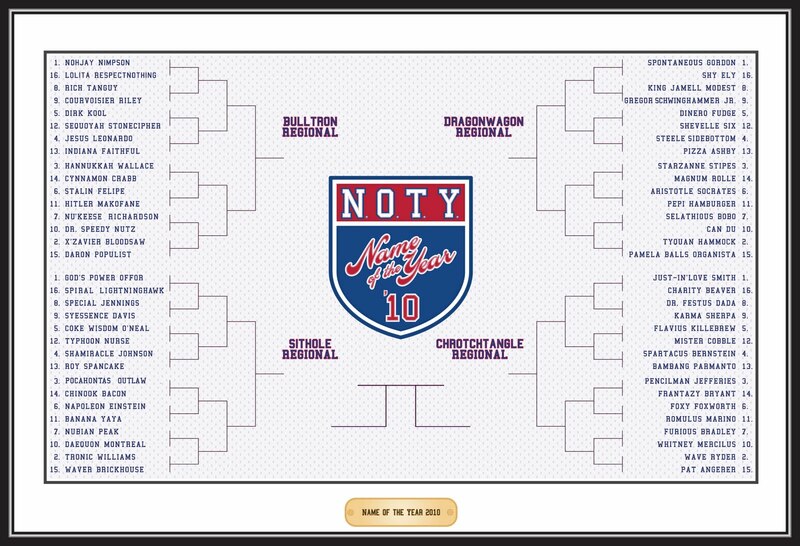 Vote now, Name of the Year fans, and remember to follow us on Twitter.